Thrash titans Sodom are by far the most reliable amongst the old German guard. Although many holds the albums from the bands early career in the highest regard, Sodom has delivered a solid stream of albums pretty much since their debut. Their last effort 'Epitome of Torture' was a real monster of an album nearly rivalling their peak of the new millennia 'M-16'. The expectations were thus more than usually high on the band's fresh piece of wax 'Decision Day'. 'Decision Day' is pure Sodom, all the components are here: the distinct German thrash sound with subtle punky vibes sporting both aggression ('Who Is God?') as well as catchy choruses (the title track). The latter a trademark of the band's post-millennial sound. The listener is, of course, also treated with the apparent Motörhead-influenced riffs ('Caligula') that has been a trademark of the Sodom sound since the band's inception. If anything the tempo has dropped somewhat in favor of a more mid-tempo oriented sound (by the bands standards) compared to previous albums. The more apparent use of "choirs" to enhance the choruses is also a welcome addition that works surprisingly well in the bands favor. Sodom has apparently found quite a stable line-up in Angelripper, Bernemann and Makka. 'Decision Day' has the vibe of a band comfortable with each other, without falling into the pit of sleaziness. Bernemann is now the longest running guitarist in the history of Sodom and the riffs he has conjured in the past are the best since Frank Blackfire bent the strings. Such is the case also on 'Decision Day'. 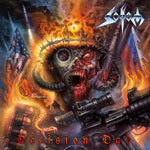 As a Sodom album 'Decision Day' is bound to be enjoyable, but also touches the heights of its predecessor. The rather mediocre album cover aside (when and why did Joe Petagno become the household cover artist of every extreme metal band? ), this album is a well-crafted continuation of the impressive streak of albums signed post-millennial Sodom. With 'Decision Day' Sodom keeps showing all the young worshippers the true essence of thrash metal as the German war machine keeps rumbling on crushing everything in its path.